With an available boost of electric power, e-bikes offer a versatile alternative for both commuter and leisure uses. What if there was a somewhat-magical device that could cut your car use, enhance your health and reduce commute time? There may be – it’s known as an electric bike, or e-bike. First, a quick intro to the e-bike world. Like a traditional bicycle, an e-bike has two wheels, pedals and a saddle. Unlike a traditional two-wheeler, an e-bike also has a motor with 750 watts or less of power. All three help you maintain or improve cycling speed with less effort. Class 2 e-bikes don’t require pedaling, and feel less like a bike. Instead, users rely on a throttle, a thumb-powered or twist-device that controls the flow of power to an electric engine. Even on our region’s steep hills (Mount Rainier excepted), Class 1 and Class 2 bikes can reach 20 mph, while Class 3 bikes can travel at 28 mph. Municipal laws can vary by city, but Washington State’s e-bike law states that Class 1 and Class 2 bikes can use bike lanes, while Class 3 bikes must stay in the street. “Power output isn’t a problem, even going up a hill with heavy cargo,” Rice says. For those intimidated by the speeds of Seattle traffic, e-bikes can help you confidently keep pace. With e-bikes, motor use is optional, Rice notes. “You can have as much of a workout as you want,” Rice says. 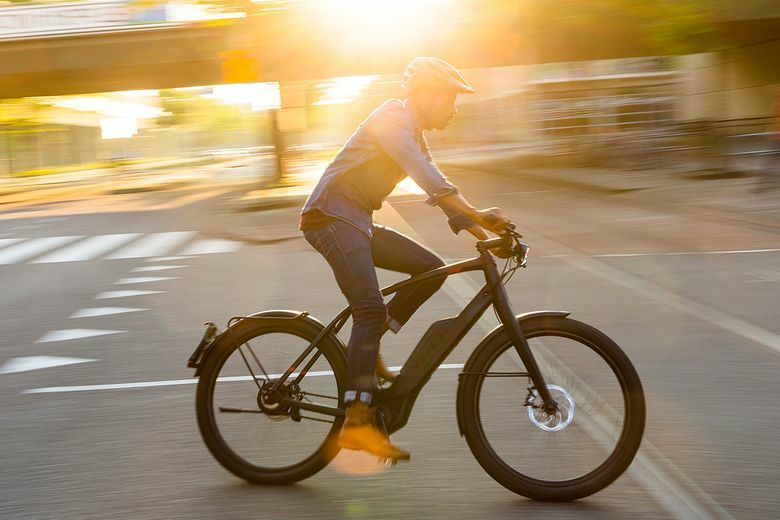 You can ride to work using electric power – and arrive still fresh. Then, turn off the power or use lower power for the ride home, where showers might be more convenient. But on your way home from work, you might feel emboldened to take the longer, more scenic route, or stop to pick up tonight’s dinner ingredients. “Even if you go through more bike chains and brake pads than with an unpowered commuter bike, it’s still cheaper than gasoline, insurance, tabs and parking,” Rice says. Of course, buses are always available, but those can get stuck in gridlock or take longer than an e-bike commute. “It’s not just cars that these bikes compete with,” he says. A bike gives you access to neighborhoods where it might be hard to find parking or it’s inconvenient to explore by car. “You can go to that restaurant that’s normally impossible to park near,” Rice says. E-bikes can increase leisure trips as well. One Gregg’s customer in his 70s was having a hard time keeping up with compatriots, despite decades of long cycling trips abroad. An e-bike allowed the road rider to join his wife and friends on long excursions around Lake Washington, or out to Bellevue. You might not ride 20 miles to a nursery to tote back large trees, Rice notes, but most car-related tasks can also be performed with an e-bike. “You can inject some fun into some otherwise mundane activities,” Rice says – whether you’re going on a weekend errand or zipping to work. Typically, he says, people start out using an e-bike for commuting, then find additional uses (and excuses) to pedal. “For many folks, an e-bike does replace a car in their lives,” he says. “One of the things I like about electric bikes is the potential for inclusivity,” Rice says: E-bikes create options for those disinclined to ride due to ability, inclination or the area’s hilly topography. As well, some neighborhoods or communities are underserved by public transportation, or have nonexistent sidewalks, he notes. An e-bike offers an accessible car alternative. In fact, some research has shown that those most interested in buying an e-bike are those currently cycling the least. As potential users learned more about e-bikes or took one for a spin, they were more likely to become interested in buying one. In general, a battery can last 60-100 miles before needing a recharge, but the life is determined by a variety of factors, including the battery size, hills, rider weight, bike weight, tire pressure, headwinds and more. You may have tried e-biking using one of the local rideshare companies, such as Lime. However, the best way to experience an e-bike’s benefits is to take a test ride, as the materials and handling are different than a rideshare e-bike, Rice says. “As with any bike, a lot of questions will be answered in the first two minutes of your first ride,” he says. The National Bicycle Dealers Association has ranked Gregg’s Cycle as one of America’s best bike shops. Gregg’s maintains a large staff of knowledgeable, enthusiastic cyclists ready to help first time riders and die-hard cycling veterans find what they need.